The Red Tailed Hawk is a powerful animal totem signifying Vision. He asks us to watch for confirmations, and listen for messages as we travel on our journey. Being aware and having a sense of peace is important in order to be conscious of those timely clues that are shown to us. If we are distracted by stresses, we may miss the "answers" that exist. The hawk allows us to see the bigger picture and our connection with it. 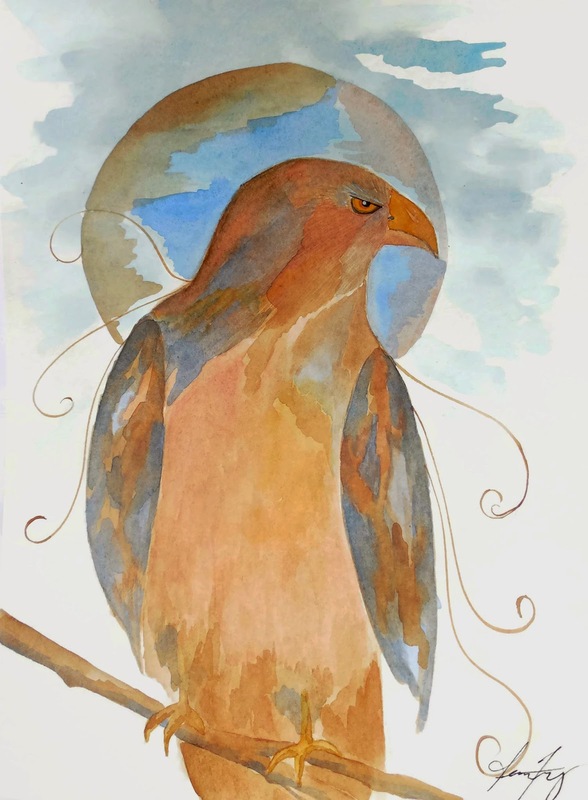 While we are continually making choices in regards to our daily living and how to handle a situation for today, the Hawk exists to also help us with "tomorrow". He helps to bridge the gap of "What can I do today that will lay the groundwork for my future?" He can also bring a better understanding of how we are all woven together in a fabric that creates "The All". 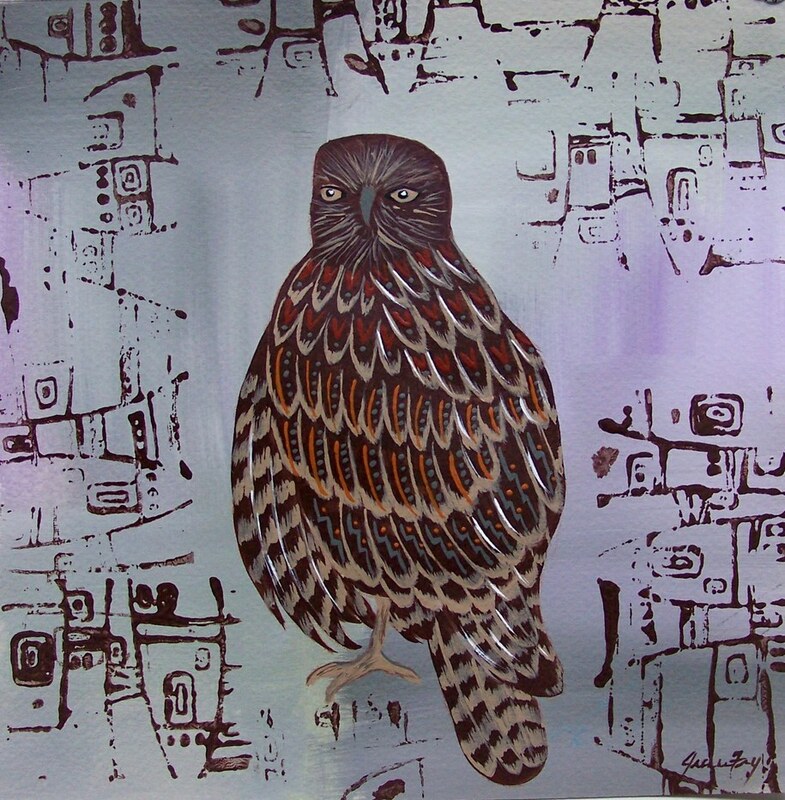 The hawk is a wonderful totem to work with when one is focused on living a life that resonates with their spirit. He inspires one to soar, to see and reach their highest potential, and to do so with powerful grace and ease. Hawk demonstrates how to find that needed balance between body, mind, and spirit....to connect with something higher, utilize our intuition, and yet stay balanced in every day life. 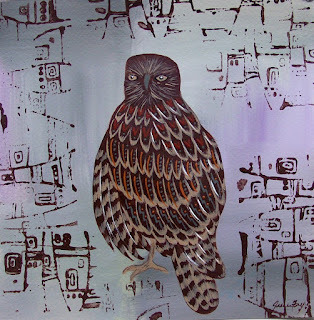 When Hawk shows up as a totem, profound meaning and growth are certain to appear. I wanted to share a special moment with you that I had with the Hawk today. This morning I was in my studio finishing up a gourd ceremonial rattle that I had been working on over the past few days. 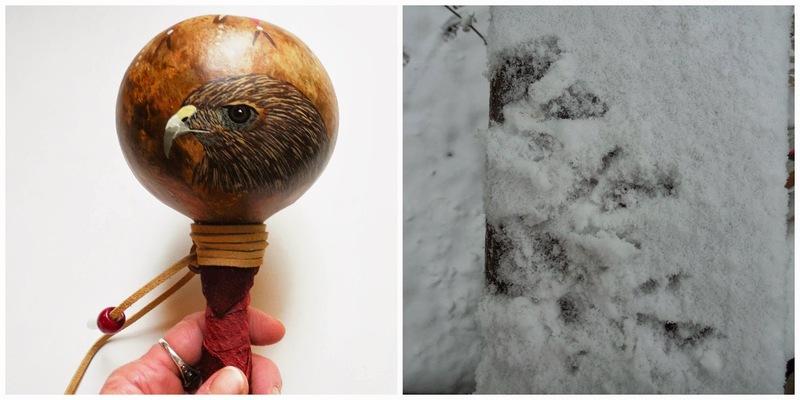 I had painted the head of a Red Tailed Hawk on the front of the rattle with some design work around the top. I was working on the leather wrapping of the handle and adding some wooden pony beads and tin cones after breakfast this morning. While I was working on it I was frequently looking out the window at the snow falling. It was very quiet and serene as the large snow flakes drifted down. I happened to look out at one point and a very large and beautiful hawk came flying down and landed on the deck railing outside my studio window. I sat and watched him silently, not wanting to startle him with my movement. He scanned the property, looking and contemplating. Time stood still as I watched him while he was on his hunt. He was so close I could see the snow flakes land on his beautiful feathers and melt as they touched him. I watched him as he flew off and then looked down, realizing I still had the Hawk Rattle in my hand. Tears welled in my eyes as I felt blessed by the Hawk, a confirmation to my spirit. I feel he left some of his energy with me and the rattle. I spent the day feeling grateful for my connection with Mother Earth and the animals, and grateful for my awareness. A few minutes later I walked outside to look at where he had landed on the deck rail. His prints were deep on the snow ledge. I took a photo of them to remember the moment. Thank you Hawk...for the awareness and the vision. One of the most meaningful expressive art modalities is Touch Drawing. 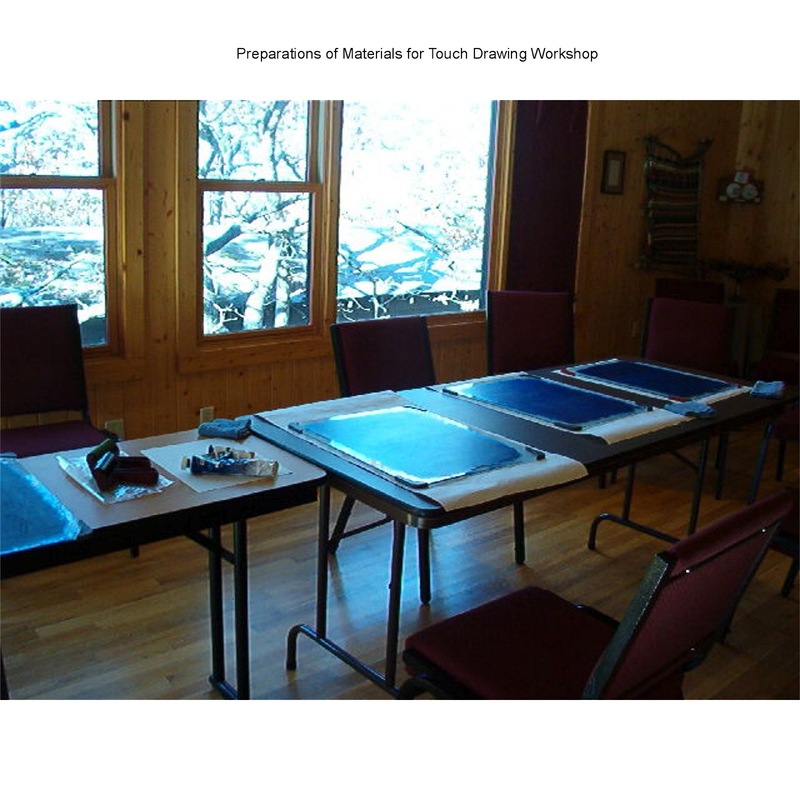 Touch Drawing is open to people of all artistic levels and helps one to explore personal growth on a new level. other similar areas in need of emotional and spiritual expression. Touch Drawing is a simple yet profound process. All you do is touch paper that has been placed over a surface of paint. The resulting impressions are seen on the other side of the page. Lines flow directly from your fingertips. Once you have completed the drawing and feel like you are finished....you turn the paper over and see the painting. Jeanne's Sessions are guided by music and voice, creating a relaxing yet inspiring space for realizing your creative potential. This is an excellent method to explore to release creative blockages and strengthen the relationship with the artist within. The Art of Spirituality Retreat and can be taken individually or as part of the entire retreat. You can learn more about the workshop on the retreat website. You can register on the site for the entire retreat, a day pass, or for the individual workshop. a place where there is ease in living. Follow me to the Secret Garden. a place where we can manifest our dreams.